Swiss voters have turned down plans to relax the country's strict citizenship laws, referendum results show. A proposal to ease naturalisation for foreigners brought up and educated in the country was defeated after 56.8% of voters opposed it. A separate proposal to grant automatic citizenship to the grandchildren of immigrants failed narrowly, with 51.6% voting against. Being born in the country will continue to be no guarantee of citizenship. The government had said it wanted to make procedures easier, saying too many people were left out of the country's system of direct democracy. 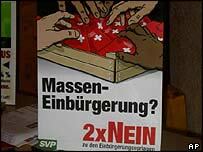 But right-wing parties launched a bitter campaign against the proposals, claiming they would undermine Swiss identity. "This is a sad day for Switzerland," said Claudio Micheloni, head of a migrants' integration association told the Associated Press. Switzerland's regional voting patterns were divided along linguistic lines, with western French-language cantons accepting the proposals and eastern German-language Alpine cantons voting against. The only Italian-speaking canton, Ticino, also voted no. The BBC's Imogen Foulkes in Berne says becoming Swiss is a long, complicated and expensive process. The decision is made locally: village communities approve or reject citizenship applications. That fits into the Swiss system of direct democracy, where the people have the last word on every political decision, she says, but the system is also open to abuse. Of a population of only seven million, Switzerland now has 1.5 million foreigners. Most were born in the country or are long-term residents. But they cannot vote and are barred from certain jobs, such as the police. In several Swiss communities, applications from candidates with a Yugoslav or African background are regularly rejected, even if they satisfy all the legal requirements. "Becoming Swiss will remain a long and complicated process"